Properties in Gioia del Colle average 4.7 out of 5 stars. Cozy farmhouse nestled in the Apulian countryside. Property 3: Cozy farmhouse nestled in the Apulian countryside. 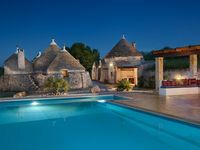 Property 15: Trullo - private heated pool - air cond - drone tour & walkthrough available! Property 50: Antiche Mura Apartment "In the Sky of Puglia"
Trullo Mario was peaceful, in a lovely rural setting, with great outdoor space, a comfy bed and lots of character. I would have scored it as excellent but lots of minor things were wrong. The indoor shower sprayed water everywhere; there was no microwave (although it was advertised as having one); the tap in the bathroom sink only worked for cold water; three of the four bulbs in the dining room had blown (and there were no spares for us to fit); the internet didn't work when we arrived; there were no cushions for the lounger; the pool was full of leaves (nobody came to clean it as promised); and one of the outdoor chair cushions was covered in mould. These are all minor but suggest that the property needs a bit of maintenance and love before it is let out again. The company were reasonably easy to deal with and the check in/out lady was very friendly and helpful. We spent six nights at Trullo Gonna with family and friends and loved every minute! Having arrived at the meeting point after dark and then traveling the narrow, winding roads to the property, we were worried that if we left the property during our vacation, we'd never find it again! But it was no trouble once we were equipped with markers. The house is truly magical. With the great weather we had (we were told it was unusually hot for September), we were able to eat outside, sit by (and in) the pool, and just generally relax when we we stayed in. With the Adriatic beaches only thirty minutes away and too many historic sites within an hour (or so) to choose from, we did venture away many times. Yes, we missed a turn once but had no trouble getting back on course. We would highly recommend this property for someone looking for unique living quarters with plenty of space, as well as proximity to other Apulian adventures. Thank you for providing such a wonderful home -- oh, and enough espresso capsules for five coffee lovers! Delicious!